How do you pronounce pizelles? Some prounce them as "pitts-sell-lays" and some pronounce them as "peez-els" (almost like gazelles), but no matter how you pronounce them, I pronounce them delicious! Please let me know how YOU pronounce pizzelles in the comment section of my blog. "P" is for Pizzelles! Come join the fun at Alphabe-Thursday. Please don't forget to enter my giveaway where you can win a PIZZELLE MAKER or four other great kitchen gifts. Please click GIVEAWAY or click on the kiwi-colored Le Creuset baking pans on the left-hand corner of my blog. If I were Italian, I would, in the future, be one of those Italian grandmothers makings scads of pizelles for my loved ones. They are easy, pretty, and fun to make. 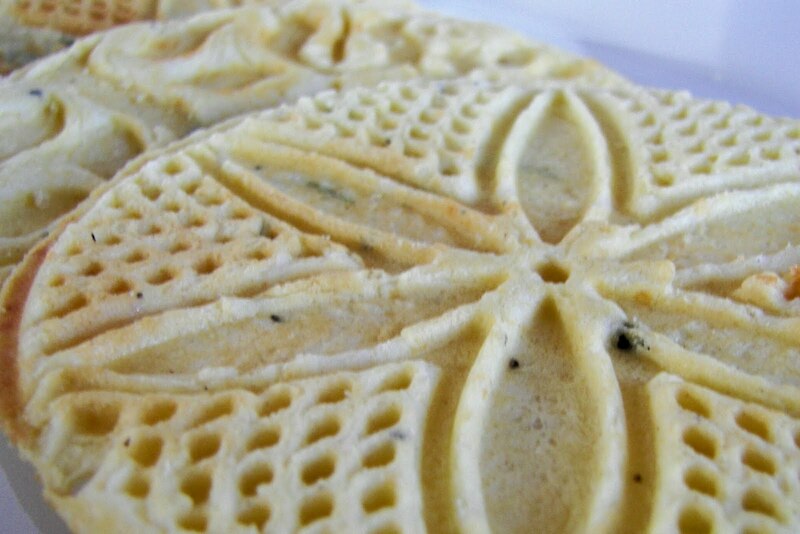 Just think of pizelle making as the embossing craft of cooking! Years ago I walked into a Ross store and they were selling Toastmaster Pizelle Makers for a really low price. I bought about five of them and gave them as gifts. 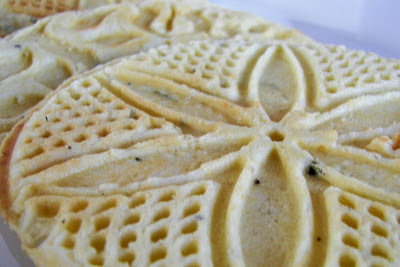 I have made pizelle cookies and have enjoyed them, but I really like these savory pizelles. Pair them with any dish, I think a tomato basil soup or some pork from the grill would be smashing! Alphabe-Thursday where the letter of the day is "P"
I found this recipe on the web before I became a blog mistress and realized how important it is to note your source. 1/4 cup parmesan cheese grated -- See note below. Fresh herbs -- See note below. In medium bowl, whisk eggs until smooth and then add cooled, melted butter. Stir in the remaining ingredients until blended. You will end up with a dough that resembles thick cake batter. 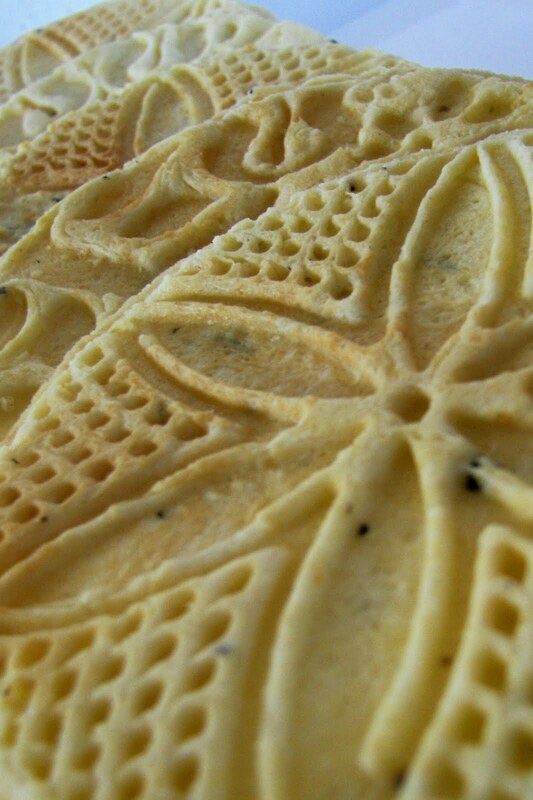 Drop batter on pizzelle iron and cook according to manufacturer's instructions. It takes a little bit of experimenting to find out how much dough to use; each pizzelle maker is different. My pizzelle baker takes about a little more than 2 tablespoons of dough for each pizzelle. It takes less than 2 minutes to bake two pizzelles. Place on racks to cool. Eat them hot! 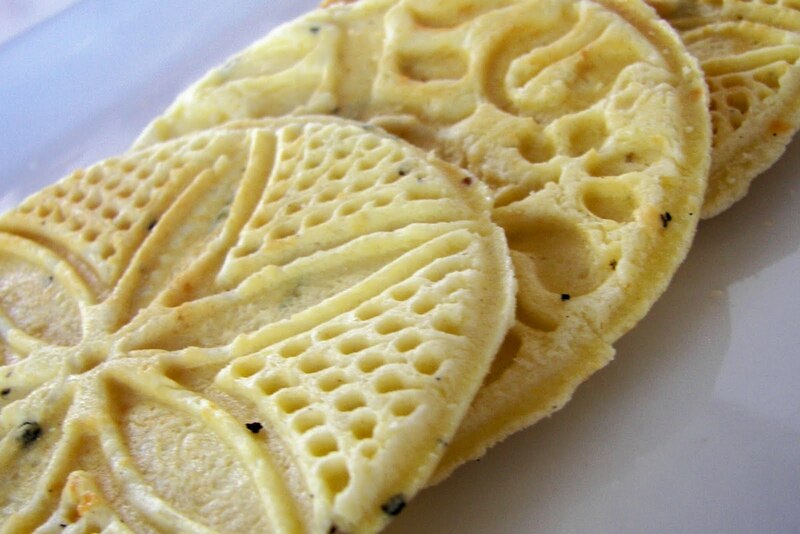 Yield: This recipe makes 10 pizzelles in my pizzelle baker; pizelle bakers vary. Notes: For a stronger flavor, try using a stronger flavored cheese. I have used both grated and canned parmesan and they both work fine in this recipe. For mild flavored herbs, like chives, use up to 3 tablespoons; for strong-flavored herbs, like rosemary, use about 1 tablespoon. I used rosemary. What fun, and pretty! They look delicious. When I try to pronounce them I say the pizz-elles. These look so delish! 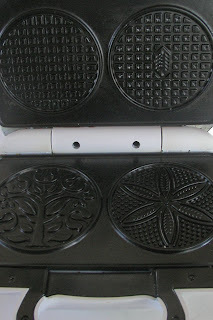 I did not know about the Pizzelle Maker...hmmm...on my list of wants now! I haven't yet figured how to pronounce them...I love my pizzelle maker to make waffle cones! These look delicious!! And so pretty! i really need to break out my pizzelle maker. it usually only makes an appearance at christmas time. i never thought about making them savory! i have all sorts of herbs to toss in. thanks for the inspiration! These look delicious! I haven't had one for over 30 years - they aren't known that much up here. When we lived near Philadelphia the neighbours made them. They pronounced them 'pittz-elles'. I pronounce them pee-zelles. Now you made my stomach rumble! These look fantastic! I've been making pizz-elles for years, but never a savory version-thanks! I just LOVE the way Pizelles look- so fun! These look yummy! I love the sweet ones, these would be yummy. I've never attempted to make them. A mouthwatering pit-sell recipe. I just love them sweet or savory! Oh, yum! This sounds delish! You've convinced me to get one of these pizzelle makers. Have you ever tried a slice of Parmesan cheese? I love to dress up a salad with something this pretty. Thanks! These look so good. I bet the savory taste is awesome. Joni, I may need to get one of these. Looks like fun! I have never had any of these but I would love to try them! Fun shapes! So it's kinda like a waffle iron? Save some...I'll be right over! These are pretty and fun and probably yummy! Pretty Patterns. Wow! Maybe I can make them in my waffle-iron? I'll have to give it a try! P.S. I'm not Italian, but I love Italy and Italian food! 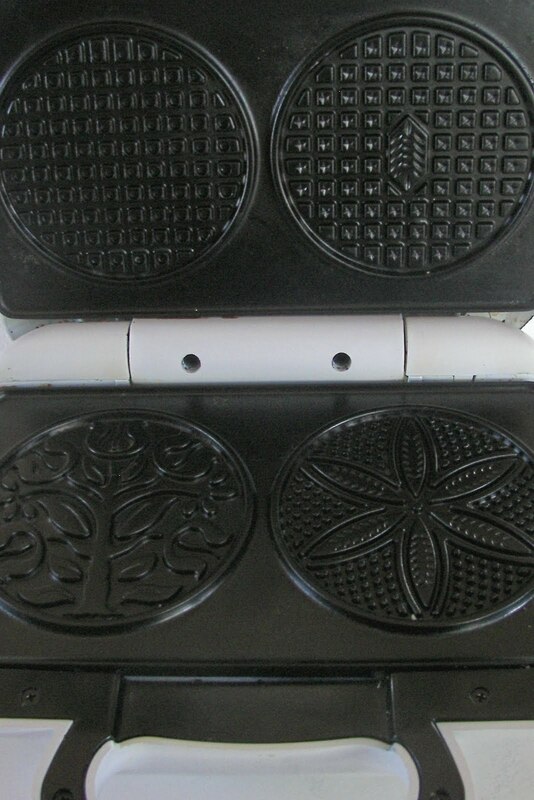 OK, now I want a Pizzelle Maker! I say it like gazelle. When we lived at my old house, the neighbors were Italian. Whenever we went for anything there were always pizzelles. I loved them. I love all the designs on yours. They sound delicious and look beautiful. I am embarrassed to say that I'd never heard of pizzelles before your blog. I would love to try them. Lovely, fun post! I have no idea how to pronounce it, I'd just say delicious! I have never heard of a Pizzelle before but if I were to pronounce it I think I would say "peezels" with a french accent. Iknew I shouldn't read this post because it has made me hungry! 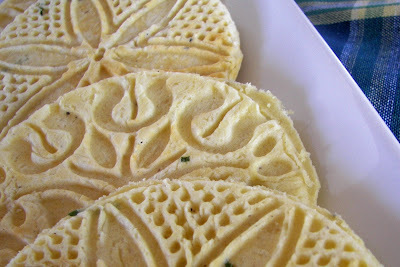 I do not know about Pizzelles but they look yummy and anything made with cheese has got to be good! Thanks for introducing us to this treat! I had never heard of pizelles but they certainly look very tasty. Pretty perfect p post too I might add. I may have to look into purchasing a pizelle maker. I have never thought of or heard of savory pizzelles but it sounds like a phantastic idea! What a tantalizing stop on this little journey through Alphabe-Thursday's Letter "P". I always enjoy stopping here, Joni. You really help make Alphabe-Thursday something special. those are so pretty, i would be afraid to eat them! I've learned something new today. I didn't know there were pizzelles or pizzelle makers. They sure look pretty and the recipe sounds delicious.